MIDORI SCALP BALANCE SHAMPOO (2) 300ML – HAIRDEPOT - Hair & Scalp Care Products, Prevent Hair Loss, Shampoo, Conditioner, Treatment, Styling, Appliances and more! 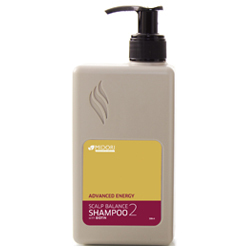 Midori Scalp Balance System 2 Shampoo for color-treated thinning hair. This detoxifying shampoo helps anti-greying, to remove follicle-clogging sebum and DHT to provide thicker-looking hair and a healthy scalp environment, and promotes safeguards hair color with UV filters. Apply to wet hair. Gently massage into scalp and work to a lather. Rinse well. For optimal results, follow up with Midori Scalp Balance Conditioner (2). Use daily.